If I could give you one piece of advice about shopping estate sales it's this: look in the garage first. I always find the best stuff in people's garages! I'm not talking a case of motor oil, or piles of nails and screws. 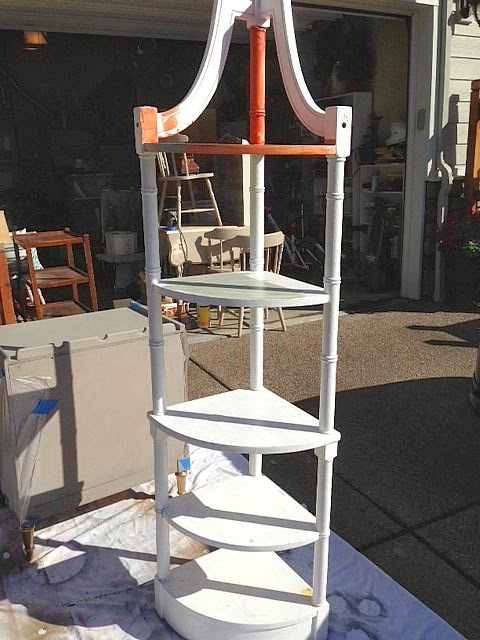 I'm talking about interesting pieces of furniture that people have relegated to their garage space, because they have stopped seeing the potential in a piece. 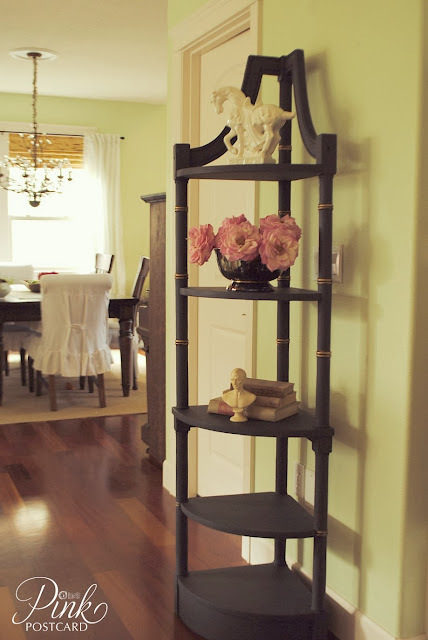 Or maybe it was always meant to be a useful / utilitarian piece but I see a new use for it! I found it in a garage next to a table saw. But it didn't look like this when I found it. 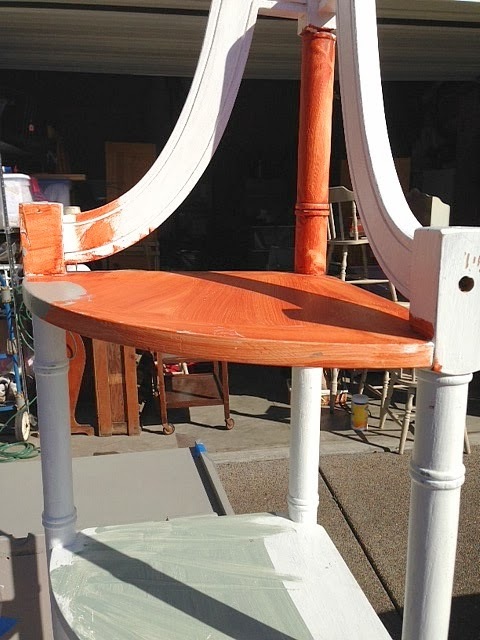 I knew that it just needed some TLC and it could be gorgeous inside someone's home. Not just as storage for leaky paint cans. I used Annie Sloan's Graphite to give this a new look. The accents got a little Antique Gold Rub N Buff. I think it's such a nice color combination. 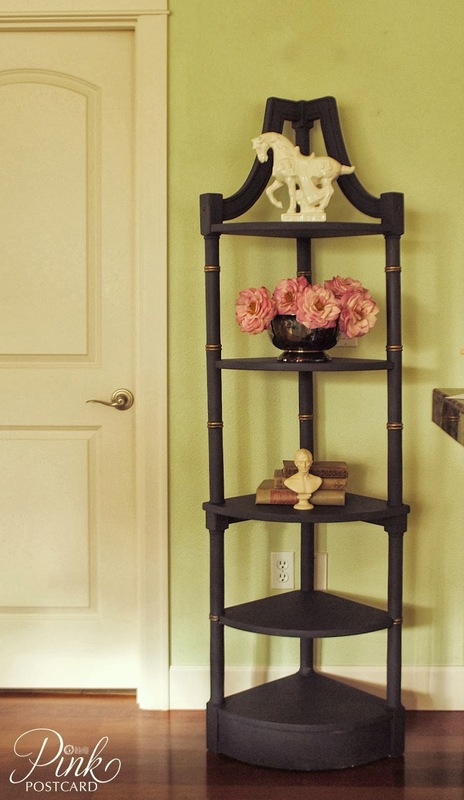 Instead of a multi color drab shelf, it looks chic and elegant now. Not quite black, but a pretty charcoal. This is definitely one of my best "garage" sale finds! I would have liked to had more time to stage this in my dining room, but I had a hole to fill in my shop space. I snapped these photos pretty quick before I ran the shelves down to Aunt Bee's House. It's now for sale and housing all my candles. I've got a garage full of more projects (as seen in the above photos) that I'm completing in the next couple weeks before The Farmhouse Show. Love your shelf. I am a blogger from Albany. It looks as if we are close to one another. I have heard of Aunt Bee's but never been. Put that one on my list. Love your blog. You are now on my sidebar. It's gorgeous, Denise! I love the graphite and gold! Good choice and perfectly executed! Nice styling, too! This won't last long in your booth! Better get something else ready to fill it's spot! It turned out just beautiful. What a great piece. I'll have to keep the advice about looking in the garage first in mind. Good tip! 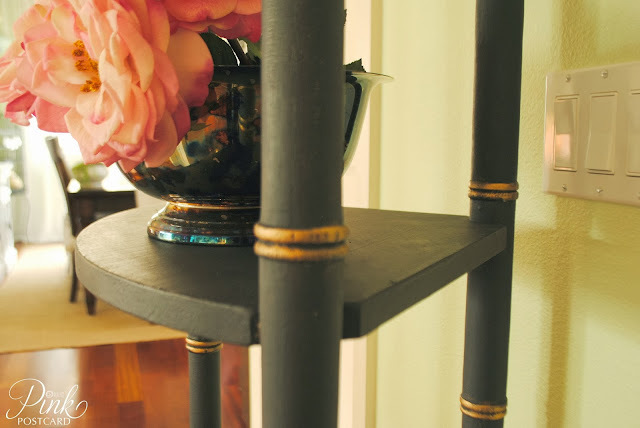 Your new shelf looks amazing after its makeover. I so agree. I stumble upon my best finds in the garage and basements. Forget main areas. Love the gold accents!